... made an illegal move (counter-check), Carlsen parried the check „correctly“ (instead of claiming a win) and then Mr Inarkiev wanted the full monty. Nice and interesting post.Arbiter at beginning also gave win to Inarkiev.It is ridicolous that a chess player famous like Inarkiev did that.If i were him i would hidden myself for a lot lot lot of time. Carlsen was really a champion to no attack him both phisically and to words.And first decision of arbiter to give win to Inarkiev was ridicolous.Carlsen with full right took full point! Plus i read some people on youtube saying it's not the first time this player does this to get a win.... It makes me remember about the canadian championship final when the guy hid the Queen in his hand when his opponent was about to promote.... I would ban this people for life tbh. The chief arbiter didn't think Inarkiev did it intentionally. But, that he had misunderstood the rulebook. He went on to say that the rules can be hard to understand even for arbiters. We can't be sure whether Inarkiev's move was intended or not. In the end, Carlsen got the deserved point anyway. "Intent" is impossible to prove. Only an admission of guilt is sufficient evidence. However, one can make a very reasonable case, based on the circumstances, that the illegal move by Inarkiev, Nd3+ was a desperation attempt in a lost position to win by a rule interpretation. Carlson played a move that kept the opponents King in check. Instead of moving his King or capturing the piece, Inarkiev freely choose to make another move, a move that checked the opponent (while he was in an obvious check, the rook in front of the King). It was desperation. Most likely he knew the "rule" that if Carlson moved his King to get out of check, Inarkiev was then prepared to claim a draw, which he did immediately. At 1st glance it appears the original ruling was correct (a loss for Carlson), but thankfully he appealed. 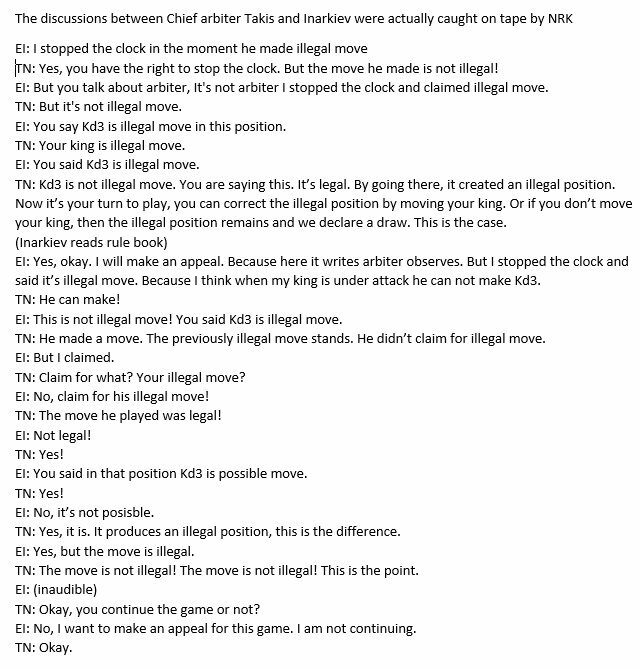 The chief arbiter had sense to realize the rule as written did not cover the circumstances, as Inarkiev was in check and had made an illegal move. Carlsons move was not illegal. For me, the clincher is Inarkiev refused to continue the game after a fair settlement was reached to continue the game at his move when in check. He forfeited, knowing he was dead lost and had made an attempt at a "ploy" to win on a technicality. He was fully aware of the rule, regarding a move leaving the opponents King in check. It is the basis of his claim. By this, it can be reasonably concluded it was his intent all along. c) A position is illegal when it cannot have been reached by any series of legal moves. Carlsens King move is indeed perfectly legal. Thats the point. "If the opponent does not claim and the arbiter does not intervene, the illegal move (aka, Inarkievs move) shall stand and the game shall continue."